In this blog, we’ll cover how the application of the materials is key to building a quality running track. Whether you’re building a new running track from the ground up or tearing out and replacing an old running track, and whether you use an Engineer/Architect design team, a Paving Company, a General Contractor or a Sports Surfaces Company, there is one very important step that cannot be overlooked and that is having the existing soils tested by an Engineering Testing Company which will in-turn give a recommendation on what needs to be done to prep the soil for the rock base. This is the absolute most important step to ensure a quality foundation for everything that comes next. The recommendation should be followed on how to prepare the soil and compact it. There are a lot of things that go into this such as moisture content the compaction percentage. The soil substrate should be tested to make sure it meets the specified requirements. Then comes the rock base. Again the recommendation of the type of rock, size and depth should be strictly followed. The Engineer would engineer this to meet your local soils and stability factors to ensure the base will perform under the conditions in your area. After the rock base is installed and compacted to the Engineers specification and industry standards, you would be ready to install the all-weather surface. You may be installing inside and outside concrete curbs and/or a flush trench or slot drain system on the inside or other methods of drainage to insure water is captured and transported away from the track surface. This all would need to be done and installed before your asphalt or concrete is installed. 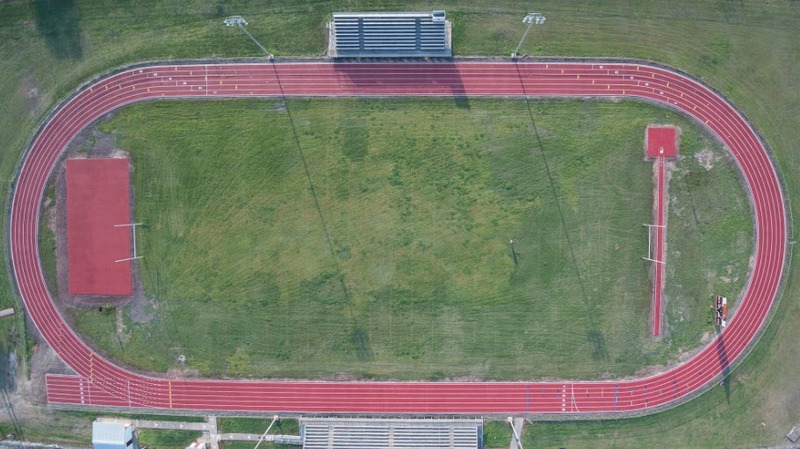 The most common place for asphalt is the track oval and the “D” area for the High Jump Apron. We recommend building stand-alone High Jump Pads and all runways in concrete. Concrete holds up ground movement and fluctuations better than asphalt, especially for runways. Building the entire track and events with concrete is gaining in popularity, whether using the standard rebar reinforced concrete or post tensioned concrete system. If building any outside sports all-weather surface out of concrete, it is mandatory that a heavy-duty 15 mil plastic vapor barrier be placed directly under the concrete. This is to retard all moisture from flowing up from the sub base through the concrete and causing hydrostatic pressure which in turn can cause the rubber system to lose its adhesion to the surface and bubble. Tolerances are much more stringent on paving asphalt or placing concrete for sports surfaces. It is not like paving a road or a parking lot or side walk. The planarity must be flat and not be greater than a 1/8” in 10’ in anyone direction. The slope must be maintained as well to ensure all water sheds off of the surface. It is important that an experienced paver do the job. Many other regulations and best practices must be followed to build a quality surface for the rubber sports surface to be installed over. We mentioned several rubber surface systems in our last blog. A Black Base Mat, Black Base Mat with a Colored Structural Spray (Wear Course), Black Mat with a Pore Sealer and a Structural Spray (Impermeable), Sandwich Systems and Full Pour Systems. All of these have many things in common to facilitate a quality installation. I will list a few below. One is they all incorporate rubber and polyurethane single or two component binders. The asphalt or concrete surface must meet its proper curing time prior to the installation of the rubber surface. The surface must be cleaned and free of oil spills and other contaminates that could affect adhesion. They all require a quality primer being applied to the surface to ensure a good mechanical bond to the asphalt or concrete surface. They all require clean tools and equipment that is mechanically sound and can be calibrated properly to do the job correctly by metering out the correct mix ratios of binder and rubber. You need a quality experienced installation crew that has the skill to do the job correctly. They all require proper temperatures and humidity levels and dry surfaces with no rain imminent. If you’ve read this whole blog series (see the first 2 blogs here and here), it should be clear that the process of getting the right prep, the right materials, and the right application for your soil conditions and weather conditions it’s a fairly complex process. But that’s what we do at Pro Track and Tennis. If you have specific questions regarding your running track, feel free to email me at lance@protrackandtennis.com.